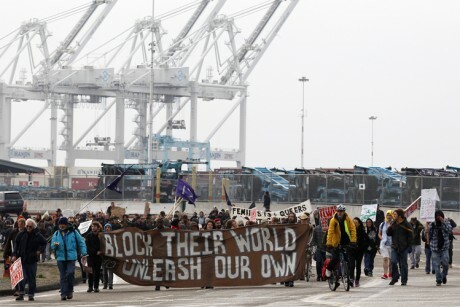 On November 2, 2011 Occupy Oakland successfully shut down the ports in Oakland along with the approval and aid of the union, ILWU Local 10, which has a contract with the port’s legal owners. This event was a tremendous leap in consciousness and something the U.S. working class has not done nor attempted in decades. Shortly after, Occupy Oakland passed another resolution for a West Coast port shutdown. Occupy movements in Portland, Long Beach, Seattle, Vancouver, Anchorage, Honolulu and Tokyo responded. On December 12, 2011 the Occupy movements succeeded in shutting down the ports completely or partially in most of those cities. However, this time around Occupy did not have the full support of the unions involved. This action has sparked debate between Occupy and the traditional labor movement encompassed in the AFL-CIO. The unions’ argument is that Occupy did not have the right to shut down the workplaces (ports) where they did not work and that this needed to be decided democratically within the bureaucracy of the ILWU. We don’t buy this argument. The Occupy movement is a reaction to the ruling class monopolizing the distribution of profits that are produced socially and collectively by the world’s working class. They use these profits to buy the government and re-instill this class monopoly; therefore, we must find strategic ways to disrupt the creation and movement of these profits as a class. We propose that the Occupy movement adopt a strategy of class struggle known as solidarity unionism and apply it to strategic points in the economic system that we are all protesting against. In this article we are going to define what solidarity unionism is, as practiced by the Industrial Workers of the World (IWW); make the argument that the entire working class has a moral right to every workplace, especially those of strategic importance in the world economy; discuss the 1934 Toledo Electric Auto-Lite strike as a historical example of solidarity unionism; and finally how this type of strategy could further the goals of the Occupy movement. Solidarity unionism is simply the strategy of unionism where 2 or more workers at one workplace come together and act in concert and fight together for better wages, benefits, and more control on the work process itself. It does not require a union contract or even majority support to act together when using the solidarity unionism model at the workplace. We simply act together because we work together, we care about each other, and we all belong to the same class. We do this because we have a moral right and obligation to stand up with and for our fellow workers regardless if others choose to do so. This strategy of unionism was practiced by most working class organizations in this country up until the 1940s and it ‘got the goods’. That is why we in the IWW hold dear this philosophy of unionism. Our working class ancestors successfully practiced this model. However, today the traditional labor movement has lost its strength and vitality ever since they stopped abiding by this principle. In the past, the 1% legally hired our children in sweat shops, legally hired us for wages below what we could use to feed ourselves and our families, legally required that we work any amount of hours they decided upon, and legally got away with all kinds of workplace abuses. Even though all of this was legally protected, it was never morally right. Our ancestors understood this and acted with a determination and discipline that was rooted in an understanding that we have a moral right to control our workplaces. It was labor that provided the moral arguments for child labor laws, minimum wages, 40-hour work week, and other important material gains for working people. By developing strategies and tactics that were rooted in an understanding of their moral right to the workplace, regardless of what the law or officials in their unions said, they won tremendous victories. This strategy worked and it is to the detriment of our entire society that the traditional labor movement no longer believes that the working class has a moral right to the workplace. But Occupy Oakland has led the way in reimagining what a labor movement might look like. Occupy Oakland acted with an understanding that they all have a moral right to those ports, even if this was an unconscious understanding. When they decided to shut down the port, they essentially transformed the strategy of solidarity unionism from an individual workplace to their entire community and acted as a class and demonstrated a glimpse of what working class power looks like. If the Occupy movement is going to succeed in making real material gains, it will have to develop a strategy to win that is rooted in an understanding that we have a moral right to all workplaces and a moral responsibility to implement that strategy. If we look at the divisions set up by the Occupy movement between the 99% and the 1%, we are essentially talking about class even if these kinds of terms are not used. This movement is a response to a small minority of people (the 1%) having a monopoly on the distribution of what the working class has produced and using that to unfairly influence our political and judicial system for their personal gains, to the detriment of everybody else. This immoral possession of society’s collective production of value is the root of why the 99% are in the streets protesting. In order to put pressure on the ruling class we will need to be able to directly challenge their monopoly on the value creating and distribution process. Where is this done? Simply, it’s done in the workplaces. Value is created when those of us in the working class come together and perform work. This process starts with the extraction of raw materials by workers, moves to a production or processing facility where workers create a commodity, then workers transport these commodities to the market and finally, workers stock the shelves and sell the final product. During this entire process, from extraction to the store, value is created by the working class and distributed by the ruling class. A very small part of this value is distributed in wages and benefits to the workers who performed the labor for this entire value creating process. A larger, but not the largest part of this value, is distributed into the buying of more machinery, replacement parts, and other operating costs. But the largest part of this value is distributed into the bank accounts of the rich. This value creating process has been going on for generations and the rich keep accumulating more and more value while those of us who actually work for a living only receive a small amount of that value. This immoral process is how we’ve come to where we are now. Where there is a 1% who probably never worked a real job in their lives, have all the value distributed into their checking accounts, yachts, multiple homes, and other material possessions that showcase their immoral greed. The rest of us, who actually work (if we are lucky enough to have a job), are struggling to pay our bills and find the time to spend with our family and friends. Within the current legal framework, all of this is legally protected, but there is nothing morally right about this entire value making and distribution process. This entire legal framework is supported and strengthened by the politicians, judges, lobbyists and the media that the 1% buy with the profits from the value that we, the workers, have created with our hard work. This entire process is definitively immoral and it is the root cause of the economic mess we find ourselves in. If the working class has a moral right to every workplace, and a moral right to the value created by our collective labor, then what does that mean when it comes to who has a right to engage in direct actions at strategic workplaces like a shutdown of a port? Do only the workers at a certain workplace have the moral right to decide what happens at a particular workplace? Or do any and all workers have that moral right? We would argue that since ports like the ones in Oakland are the entry and exit points for Capital in this country and hold a privileged and strategic position within the economy then we all have a moral right to that workplace. Since we all have a moral right to that workplace, then it is absolutely morally right for the working class to decide and apply force to shut down the port. That port in Oakland legally belongs to a private company, but it morally and functionally belongs to us all. The ILWU and its’ rank and file have a legal contract and a legal right to work there; they also have a moral right to that workplace. But, the ILWU and its’ rank and file aren’t the only members of the working class who have a moral right to those ports. All workers have a moral right to decide what happens at that port. The importance of the ports to the circulation of capital in our economy is undeniable. The actions taken there affect not simply the workers at each specific port, but also concretely impact the material conditions of the working class in this country as a whole. Given this fact, all workers not only have the moral right to control their operation, but a moral obligation to do so. Regardless of what the ILWU leadership and other critics within the traditional labor movement may say about Occupy Oakland not having the right to call for a shutdown of the port, they are wrong and Occupy Oakland had every moral right to make and implement that decision. In fact, the failure of the union bureaucracy to support such an action is not exemplary of a high-minded concern for the individual longshoremen, but rather cowardice in the face of ruling class intimidation. By criticizing the Occupy movement for facilitating direct action against the ruling class, the ILWU leadership is shirking its own moral duty to act as the representatives of the working class. Shutting down the ports caused damage to the port’s legal owners and this kind of strategy carried out on a larger scale at strategic workplaces throughout the country and the world would cause damage to the entire 1%, the ‘legal’ owners of all the value we have created. We have a moral right to those workplaces and the value created by our labor; we need to challenge the legality of this value creating and distribution process and assert our moral rights, as a class, to these workplaces. Applying the model of solidarity unionism at a single workplace with the aid of a community and members of the working class who don’t actually work there has historical precedence. Our working class ancestors used it frequently in the past when the labor movement had strength, vitality, and power. One of the most famous examples of solidarity unionism used in the framework that we are arguing for is the Toledo Electric Auto-Lite Strike of 1934. “Electric Auto-Lite was one of the largest makers of automobile parts in a city that was home to many independent parts suppliers. When the depression hit Toledo, there were many layoffs and a cutback in hours and wages for those who still had their jobs. When an AFL union struck Electric Auto-Lite in April 1934 over union recognition and unsatisfactory wages, no more than half the plant’s workers stopped work, allowing the company to continue operation with its loyal employees and some replacement workers. In sympathy, employees at two neighboring factories – the Logan Gear Company and the Bingham Stamping Company – had joined the strike, but the real boost along the picket line came from the Lucas County Unemployed League. The ruling class’ courts ordered an injunction to restrict picketing, but with the help of the Unemployed League the strike was able to put as many as 6,000 protestors before the plant’s gates, shutting down the plant and rendering impossible any attempt to actually enforce the courts injunction order. After 2 days of fierce fighting the operators made the judicious decision to shutter the plant. When the plant reopened, management had agreed to recognize the AFL as the employees’ collective bargaining agent, introduced a slight wage hike, and rehired most of those who had gone out with the strikers.” Solidarity unionism got the goods. They won because they started with the premise that they all had a moral right to that workplace and a moral obligation to shut down the factory, even with a minority of workers at the plant, until management ceded to their demands. Solidarity unionism got the goods. WHY SOLIDARITY UNIONISM AND OCCUPY? On the face of it, the philosophy of solidarity unionism, with its focus on the unity of the working class, seems incompatible with the broader ethic of unity advocated by the Occupy movement. Yet this incompatibility is based only on appearance. The Occupy movement, consciously or unconsciously, has begun a dialogue about class power within global society – and inevitably, given the material facts of class struggle, this dialogue will develop naturally toward the expression of class contradictions in our economy. At the heart of the Occupy movement is an ethical and moral argument – that the ruling class has a monopoly over the distribution of value created by the working class and that this is contradictory to democracy. What began as a movement centered on income inequality has expanded to include housing inequality, student debt and cultural alienation; now the movement is growing further to include labor struggle and class power. This development is not, as some have argued, an example of Occupy straying from its original message – it is progressing logically from its’ original issue of income inequality. Oakland, by acting on the premise that they have a moral right to strategic workplaces in the economy, has emerged as a leader in the Occupy movement. Their strategy, which we argue is an extension of solidarity unionism from one workplace to the entire economy, will challenge the ruling class’ monopoly on the distribution of value. The model of organization adopted and developed by the Occupy movement complements the idea of solidarity unionism. The next challenge of the Occupy movement is to put into action the nice-sounding slogans about equality and solidarity. We have already seen a promising beginning in the occupations of foreclosed homes and port shutdowns. But the movement cannot stop there: if it seriously wants to change the inequalities that it protests, Occupy must understand that we have a moral right to the workplace, engage directly in struggle with the ruling class, and challenge their legal claim to distribute the value that we created. A popular assembly like Occupy cannot do this alone. It can engage in this type of struggle by drawing attention to labor and working class issues as a whole, as well as play an important part as protestors and picketers as evidenced by the Auto-Lite Strike of 1934. If the Occupy movement can learn from examples like this and transition from symbolic demonstrations into substantive, collective direct actions as witnessed in Oakland, and the premise we have a moral right to these workplaces, then Occupy will be able to develop the power to challenge the ruling class.